What is the purpose of the Mansfield ISD Children’s Center? This center is a Child Development LAB School located on the Ben Barber CTA campus. The purpose of the center is to provide high quality child care for two-year old through five-year old children while fulfilling our Mission Statement to emphasize “real world” tasks for the high school students. Only Mansfield ISD employees may apply for enrollment of their children. The school year will be opened starting the first Monday of Professional Development in August through the scheduled Teacher’s Workday in June. What hours will the center be open? The hours of operation are 6:30 a.m.to 5:00 p.m. When pre-arranged, "after 5:00" closings for faculty can be arranged. Care will not be provided during the summer months. What is the cost of child care at the Children’s Center? Currently, the cost is $39 per day that Mansfield ISD is open. breakfast, lunch and an afternoon snack are included in the daily rate. We do not charge for days that the district is closed. What are the guidelines for enrolling my child? Admission into the program is based on the date the Waiting List form is received and on a first-come,first-serve basis. Currently enrolled children will receive first priority for each new school year enrollment period. A trained and professional supervisor and experienced adult staff will be responsible for the well-being of the young children. 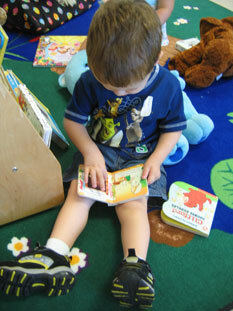 The Children’s Center has developmentally age appropriate activities, lesson plans and daily schedules. Will MISD high school students work at the center? The MISD students will be observing and interacting with the children under the supervision of the full-time instructors. High school students will not be employed by the center. How many children will be enrolled in the center? Full enrollment is 40 children. Enrollment is based on the square footage of the two classrooms and the staff/child ratios that are regulated by Texas Day Care Licensing. What if I have two children that I would like to enroll in the center? If selected, all eligible age appropriate children in a family will be enrolled. Tuition is per child. What if more children apply than there are spaces for? Those children who are not placed for the current school year may stay on a waiting list for the next available opening for their age group. Those children who are not placed during the current school year may stay on a Waiting List for the next available opening in their age group. It is not developmentally appropriate to expect children younger than three years of age to be completely potty trained. That physical requirement is not required until a child is four or five years of age and heading into the Pre-Kindergarten classroom.